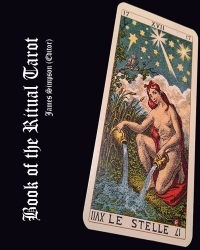 The Book of the Ritual Tarot, takes the reader through the angelic spells that can be performed to request help and assistance from the archangels . The Tarot is not examined as a fortune-telling tool, but a means of invoking the powers of the Tarot symbolism, which may be used to reduce the effects of Karmic situations. The Tarot may also be used to construct a Shield of Power, a talisman, unique to you, that will provide an umbrella of protection over your family and home. There are chapters on, simple yearly forecast you may use for the year ahead, growth and assistance spells, how to address Karmic situations and enhancing your rituals with the use of he Angelic Magickal Scripts. The more one studies the inner mysteries of the tarot (apart from the fortune-telling symbolism, which is different) the more one realizes that, properly understood, it is a book of wisdom in itself that reveals things to the earnest student, just when they are ready for a Magickal revelation. In delving into its hidden (and long lost) Arcane, I have found that the complete meaning of the symbols of any particular card becomes suddenly apparent, perhaps long after you have stopped contemplating its meaning and symbolic significance. In this respect, the study of the tarot is very much like that of the Angelic Kabbalah itself, which hides what it wants to hide until it is ready to be reveal its secrets to the student. All truly magickal (or occult) traditions use this method of tuition and teaching. The words may be there, but their sense or real meaning only becomes clear when you need to understand it. That is how occult secrets are hidden; one's own ignorance acts as a blindfold, when desire for enlightenment starts to loosen, though it doesn't fall away until you are ready to use the knowledge wisely. Tarot cards just carry pictures. The main designs all agree, although some contain more detail than others. The power of the Tarot lies not in the cards themselves, but in the knowledge the reader possesses which he or she can align to the individual cards themselves. This eBook may be used as a stand-alone spell book, or if you are following the initiation series, it will enhance your knowledge and studies. "The guardian angels of life fly so high as to be beyond our sight, but they are always looking down upon us.